You may also like. Why do you need us? 1 Wide Input Voltage. Input DC Voltage Range 5-15V. When no user calls, the device works in standby mode, the uplink power amplifier is switched off, and the static power is decreased by 30%, so as to achieve the purpose of energy saving. 4 AGC (Automatic Gain Control). When the downlink output signal is too strong or self-oscillated, the uplink and downlink can automatically reduce the gain and reduce the interference signal. 5 Automatic Power Shut-down. When the self-oscillation happens, and the link attenuation value reaches 20dB, the MCU sends out the instruction and shut-down the PA. 6 MGC (Manual Gain Control). In order to install the booster conveniently, all frequency band of the booster have the Gain attenuation adjustment function, the adjustment scope is 0-20dB. You can rotate the Manual Gain Control Knob to the OFF state and turn off the corresponding frequency band. 7 ALC(Automatic Level Control). Automatically adjust the output gain down to optimal figure while the output gain is above the optimal figure by the ALC circuit, this can greatly optimize the calling quality, data transfer quality, avoid the signal self- oscillation, and also very much reduce the interference to the cell tower, even if your house is very close from the cell tower, you don’t need to worry about the interference and the trouble caused. Three Months Free Replacement. Support Wholesales, More Units More Discount. Small size and Low Operating Temperature. Complete package – everything you need is in the box, very easy to install. 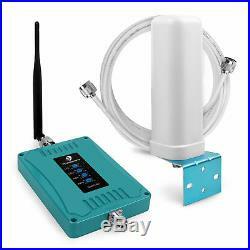 Works in any inside location where improved cellular signal is needed: homes, offices, buildings. CE authentication certificated. Significantly improves voice and data quality. Greatly reduces disconnects and drops call. Works wirelessly with multiple cell phones and data cards simultaneously. Easy to install and operation. 20dB / 1dB step. When self-oscillation happen or attenuation value reaches 20dB, power supply is shut down. Nput signals may be not enough. The attenuation value is more than 12dB. 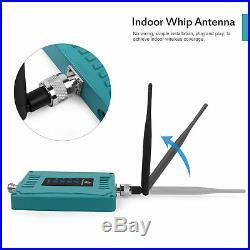 1 3dBi Indoor Whip Antenna. 1 6dBi Outdoor Omni Antenna with 50 feet Low Loss Cable. 4 Screws for Mounting. 1 English User Manual. Steps that describe the work of Repeater. 1 The outside antenna receives the signal from the nearest mobile base station. 2 The outside antenna sends the received signal through the coax cable to the installed Repeater. 3 The Repeater accepts the low signal and improves it. 4 The improved signal goes to the inside antenna through the connection coax cable. Wrong frequency and only 1 bar or 0 bar outside signal may make booster not working. Please check related frequency sites or call network operator to make sure the right local frequency from base station. If any problem with the booster, please do not open the return request or case which can bring great harm to our soreplease contact the customer service and we will try our best to solve. We can provide high quality products and solutions that you want from your amplifier suppliers. How does it work? Can I use the signal booster when the outdoor signal has 0 bar? 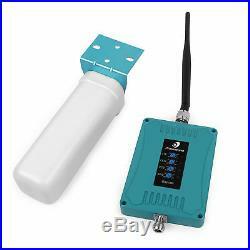 1 A signal booster kit mainly includes a signal amplifier , an outdoor antenna(with a 10 meters coaxial cable), and an internal antenna(with a 5 meters coaxial cable) etc. For example, if your outside signal has 0 bar, it can not work or bring you any signal. My outside signal only has 1 bar, the booster can bring me signal? According to this situation, you need a higher dB gain booster (80dB gain)+ a higher dbi outdoor LPDA antenna+ a higher dbi indoor wall panel antenna. You can contact our customer service to get related information. What do I need to know before ordering a signal booster? Before ordering, you need to know your network operator frequency. Every network operator has its own technology and frequency. 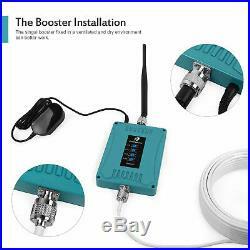 The signal booster can only work well when it is suitable for your network frequency, otherwise it would not boost any signal. I do not know my network frequency? How can I know it? Before ordering, you can search the frequency site or call your network operator to get information: Other choice: contact the customer service to provide related information to recommend. Tell us your network operator , and it is used in which country. Tell us network current signal type(2g 3g or 4g) C. Tell us to use it to transmit voice or data. How can we do if we order the wrong frequency booster? You can contact the customer service to get the solution. Why is my signal still same after installing the booster kit? The booster or the antenna is broken down. Maybe it is the signal input and signal output interfere with each other. You need make sure: There is separate wall between indoor and outdoor antenna, so that the two antenna signal do not interfere with each other. Please try to change the direction of outdoor antenna. What square meters signal will the booster cover. According to the house construction, material, outside signal, etc. It can boost signal as much as 2000 square meters. More information, you can contact the customer service. About receiving the incomplete parcel? Houses are built with much reinforced concrete, roof is with heat shield , or the outside walls are backed with foil. In this case, the signal booster can work and play an important role. What is the difference of different outdoor antennas? For area with good outdoor signal strength, you will need the standard Omni directional antenna which does not need to be pointed at the local mast asit receives and broadcasts the signal in all directions, such as the omni tube antenna , the fiber glass antenna, etc. If the outdoor signal is weak, you need the outdoor directional antenna which should be pointed to the base station to get signal, such as the outdoor yagi antenna, the outdoor LPDA antenna, etc. What is the difference of different indoor antennas? The right angle antenna is the plug and play antenna, and it does not have cable, but convenient to install, suitable for the area around 100 square meters. The indoor ceiling antenna and the indoor wall panel antenna have 5 meters cables, more flexible, 4-6 of these antennas can be connected to one booster standalone to bring signal around 4-6 rooms, which covers signal around 2000 square meters, especially suitable for the large area such as factory, company office, multilayer building, etc. What you need to do about return: 1When getting boosters, contact customer service directly to solve your return within 30 days without needing to open return request. On the store, we can solve it as soon as possible. PHONETONE booster provides a rapid and perfect solution to solve and optimize the weak signal of houses, offices, hotels, elevators, underground parking lots and other small weak signal area. Welcome you all to order. We provide the best sale service and after sale service. 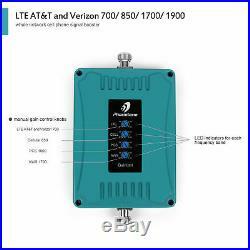 The item “Verizon&ATT 700/850/1700/1900MHz 2G 3G 4G Cell Phone Signal Booster Repeater Kit” is in sale since Wednesday, January 31, 2018. 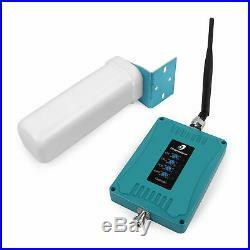 This item is in the category “Cell Phones & Accessories\Cell Phone Accessories\Signal Boosters”. The seller is “repeaterbay” and is located in City of Industry California. This item can be shipped to United States.